Yams. I love 'em. (Actually, technically I mean sweet potatoes, since what we call "yams" here in the US aren't actual yams, but the root from a South American plant, Ipomoea batatas, related to the morning glory. I'm not sure I've ever had an actual yam, a tuber from an African plant of the genus Dioscorea). But what's up with the way people cook them? You take something that's inherently sweet and yummy -- and then you cover them with brown sugar and marshmallows and maple syrup and who knows what else. Do you sprinkle sugar on apples before you eat them? Normally, I bake a yam for about an hour in the oven, or, if time is short (which it usually is), microwave it for about four and a half minutes, then finish up with 20-40 minutes in a toaster oven at 350°. The oven part seems to be necessary: it brings out the sweetness and the nice crumbly texture in a way that the microwave doesn't. You can read about some of the science behind this at this Serious Eats discussion of cooking sweet potatoes: it's because sweet potatoes have an odd enzyme, beta amylase, that breaks down carbohydrates into sugars, thus bringing out the vegetable's sweetness, but that enzyme only works in a limited temperature range, so if you heat up a sweet potato too fast the enzyme doesn't have time to work. But Thanksgiving is coming up, and for a friend's dinner party, I wanted to make something a little more festive (and more easily parceled out) than whole baked yams. A web search wasn't much help: nearly everything I found involved either brown sugar or syrup. The most interesting casserole recipes I saw fell into two categories: sweet and spicy yams with chile powder and cayenne pepper (and brown sugar), and for yam-apple casserole (with brown sugar and lemon juice). As far as I can tell it has never occurred to anyone, before me, to try either of these without added sugar. So I bravely volunteered myself as test subject. I was very pleased with the results. The combination of the tart apples, the sweet yams and the various spices made a lovely combination. And it's a lot healthier than the casseroles with all the sugary stuff piled on top. Yams, as many as needed. Apples: 1-2 apples per yam. Use a tart variety, like granny smith. Drizzle a little olive oil over the yam and apple pieces, then sprinkle spices. Your call as to which spices and how much. Toss it all together until the pieces are all evenly coated with oil and the spices look evenly distributed. Lay out in a casserole dish or cake pan and bake at 350°F until the yam pieces are soft. This takes at least an hour, two if you made big pieces or layered the pieces thickly in the pan. The apples will mostly disintegrate into little mushy bits between the pieces of yam, but that's fine -- they're there for flavor, not consistency. Note: After reading about beta-amylase and its temperature range, I had the bright idea that it would be even better to do this in a crockpot. Long cooking at low temps, right? Wrong! The result was terrible, almost completely tasteless. Stick to using the oven. I'm going to try adding some parsnips, too, though parsnips seem to need to cook longer than sweet potatoes, so it might help to pre-cooked the parsnips a few minutes in the microwave before tossing them in with the yams and apples. Am I the only one who's always confused about when holidays happen? Partly it's software, I guess. In these days of everybody keeping their schedules on Google's or Apple's servers, maybe most people keep up on these things. But being the dinosaur I am, I'm still resistant to keeping my schedule in the cloud on a public server. What if I need to check for upcoming events while I'm on a trip out in the remote desert somewhere? (Not to mention the obvious privacy considerations.) For years I used PalmOS PDAs, but when I switched to Android and discovered how poor the offline calendar options are, I decided that I should learn how to use the old Unix standby. Of course, I can also have it email me with reminders, or pop up a window, but so far I haven't felt the need. The first prints an ascii calendar; the second displays a nice postscript calendar complete with little icons for phases of the moon. But what about those holidays? Web searching didn't help much. Unfortunately, "remind" is a terrible name in this age of search engines. If someone has already solved this problem, I sure wasn't able to find any evidence of it. So instead, I went to Wikipedia's list of US holidays, with the remind man page in another tab, and wrote remind stanzas for each one -- except Easter, which is much more complicated. The %b in each case is what gives you the notice of when the event is in your reminders, e.g. "Easter tomorrow" or "Easter in two days' time". The +1 is how far beforehand you want to be reminded of each event. So here's my remind file for US holidays. I make no guarantees that every one is right, though I did check them for the next 12 months and they all seem to be working. Posole is a traditional New Mexican dish made with pork, hominy and chile. Most often it's made with red chile, but Dave and I are both green chile fans so that's how I make it. I make no claims as to the resemblance between my posole and anything traditional; but it sure is good after a cold, windy day like we had today. Dave is leery of anything called "posole" -- I think the hominy reminds him visually of garbanzo beans, which he dislikes -- but he admits that they taste fine in this stew. I call it "green chile stew" rather than "posole" when talking to him, and then he gets enthusiastic. Start the crockpot heating: I start it on high then turn it down later. Add broth. Dice potato. At least half the potato should be in small pieces, say 1/4" cubes, or even shredded; the other half can be larger chunks. I leave the skin on. Pre-cook diced potato in the microwave for 7 minutes or until nearly soft enough to eat, in a loosely covered bowl with maybe 1" of water in the bottom. (This will get messy and the water gets all over and you have to clean the microwave afterward. I haven't found a solution to that yet.) Dump cooked potato into crockpot. Dice pork into stew-sized pieces, trimming fat as desired. Add to crockpot. De-skin and de-seed the green chiles and cut into short strips. (Or use canned or frozen.) Add to crockpot. Add spices: salt, chile powder, cumin, and hot sauce (if your chiles aren't hot enough -- we have a bulk order of mild chiles this year so I sprinkled liberally with Tapatio). Cover, reduce heat to low. Serve with bread, tortillas, sopaipillas or similar. French bread baked from the refrigerated dough in the supermarket works well if you aren't brave enough to make sopaipillas (I'm not, yet). The split between Save and Export that GIMP introduced in version 2.8 has been a matter of much controversy. It's been over two years now, and people are still complaining on the gimp-users list. Early on, I wrote a simple Python plug-in called Save-Export Clean, which saved over an image's current save or export filename regardless of whether the filename was XCF (save) or a different format (export). The idea was that you could bind Ctrl-S to the plug-in and not be pestered by needing to remember whether it was XCF, JPG or what. Save-Export Clean has been widely cited, and I hope it's helped some people who were bothered by the Save/Export split. But personally I didn't like it very much. It wasn't very flexible -- there was no way to change the filename, for one thing, and it was awfully easy to overwrite an original image without knowing that you'd done it. I went back to using GIMP's separate Save and Export, but in the back of my mind I was turning over ideas, trying to understand my workflow and what I really wanted out of a GIMP Save plug-in. The result of that was a new Python plug-in called Saver. I first wrote it a year ago, but I've been tweaking it and using it since then, with Ctrl-S bound to Saverand Ctrl-Shift-S bound to Saver as...). I wanted to make sure that it was useful and working reliably ... and somehow I never got around to writing it up and announcing it formally ... until now. Saver, like Save/Export Clean, will overwrite your chosen filename, whether XCF or another format, and will mark the image as saved so GIMP won't pester you when you exit. A Saver as... option so you can change the filename or file type. Merges multiple layers so they'll show up properly in your JPG or PNG image. An option to save as .xcf or .xcf.gz and, at the same time, export a copy in another format, possibly scaled down. So you can maintain your multi-layer XCF image but also update the JPG copy that you're going to put on the web. I've been using Saver for nearly all my saving for the past year. If I'm just making a quick edit of a JPEG camera image, Ctrl-S overwrites it without questioning me. If I'm editing an elaborate multi-layer GIMP project, Ctrl-S overwrites the .xcf.gz. 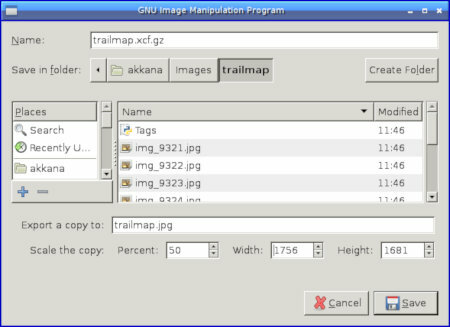 If I'm planning to export that image for the web, I Ctrl-Shift-S to bring up the Saver As... dialog, make sure the main filename is .xcf.gz, set a name (ending in .jpg) for the exported copy; and from then on, Ctrl-S will save both the XCF and the JPG copy. Saver is available on my github page, with installation instructions here: GIMP Saver and Save/Export Clean Plug-ins. I hope you find it useful.